Elementary students experience a sampling of 19th century life with visits to a selection of buildings. The Sampler typically includes the one-room school, farmhouse, and tollgate house, however, other buildings($1/building) can be added or substituted based on the grade level and area being studied. The Sampler includes hands-on activities, such as making butter from cream in the farmhouse and using slates in ​​the schoolhouse. Cost: $3/participant for one-and-a-half hours; accommodates up to 60 participants. Participants include students and adult chaperones. Teachers are not charged. 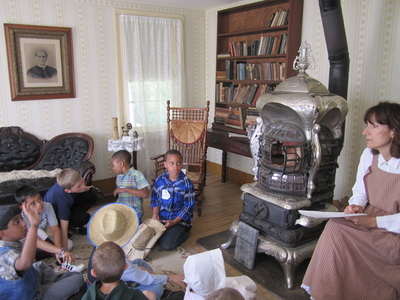 You and your students experience a typical school day in this teacher-conducted program. We provide McGuffey Readers, slates and slate pencils, and a teacher's manual with sample curriculum. Cost: $2.50/participant for three hours in the schoolhouse. Participants include students and adult chaperones. Teachers are not charged.​ This program can be combined with the Village Sampler for an additional $1.50/participant ($4.00 total) and up to four-and-a-half to five hours total. "Chore" activities can also be added to your visit. Chores may include: doing laundry outside; shelling and grinding corn into cornmeal; or drop spinning. Other activities may be available upon request. Cost: $1/ participant. ​Participants include students and adult chaperones. Teachers are not charged. 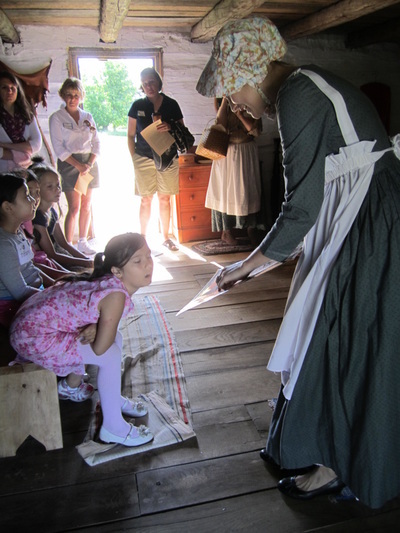 Students, teachers, and parents use the Village as their classroom for up to a week. Changing the concept of the traditional field trip to a multiple day interdisciplinary study trip, this experience includes unique student activities, investigations, behind-the-scenes tours and presentations by community experts. Teachers and parents are actively involved in the learning process. Every BIG History Lesson is unique because it is created by teachers for their students. 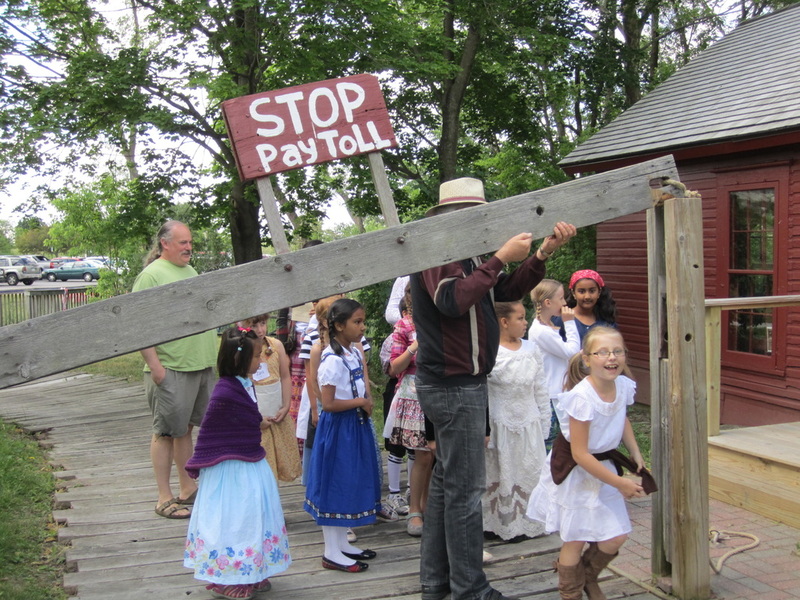 Elementary students from Haslett, Laingsburg, Mason and Okemos schools all currently participate in BIG History Lessons at the Village. Cost: $2.00/day per student ($10/week). Teachers, parents and other adult helpers are not charged. If Village staff or volunteers are requested for demonstrations during the week, an additional $1.00 per student is charged for each demonstration or activity. The BIG History Lesson was first developed in 1999 by Margaret Holtschlag, Michigan Teacher of the Year 1999-2000 as (1) a professional development model for immersion learning; (2) a study trip for students, parents, and teachers, and (3) a partnership between community resources and mid-Michigan schools. For more detailed information about BIG Lessons, please visit the BIG Lesson Program. To learn more about the BIG History Lesson or any of the above school tours, please contact us. Docents help students compare and contrast current and past lifestyles.